How are people storing all the cards without Footlocker? I have 2nd Ed and expansions 1-8, some of which are also 2nd Ed which I think negates most of the need for Footlocker. 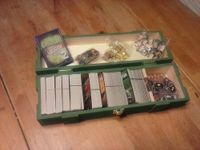 So has anyone got a good card storage suggestion for me as I’m currently overflowing (tokens are in a GMT tray). Ye olde card filing trays have been suggested.. Thanks but what exactly are they? I’ve searched online and best I’ve seen is an Ultra Pro Four Compartment” which isn’t quite right. If I google “filing tray” I see the same things I have on my desk at work for filing in/out trays, flat and A4 sized, which I’m guessing isn’t what you mean. I’ve used something similar to this in the past. Basically just a card board box. Not what I’m using now as I’m expecting delivery of my Footlocker this week. I would still get the footlocker. This game is a card monster already and there’s going to be even more expansions. Also in the footlocker is a set of cards adding night missions (and equipment) to the Middle East region. Plus with the footlocker everything fits in one box. You list expansions 1-8. Did you pass on getting #9? #9 is by far my favorite and I highly recommend it. 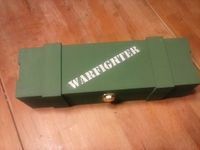 Footlocker, to me, will be £46 for a big box, night missions and scenario book. I can’t justify that. Espactially after just forcing out £92 for the expansions (I have 1-8, excluding 4 (bullet dice)). I thought 9 was Footlocker? It is the footlocker, but as noted it also includes new cards for night missions as well as the scenario book. It does include replacement cards also, which aren’t as needed for second edition I agree. If your interested in the night missions or scenarios book this is the only way to get them that I’m aware of. Certainly understand the cost piece. I was going back and forth for a while about it myself. The replacement cards weren’t something I really wanted. Decided to get it anyway for the night missions and scenario book. The replacements will be used as “extra” equipment cards and the locations will be repurposed. Mainly I’ll use them as stiffeners for the extras made available in the files section (advanced scopes and dogs nps). Because I sleeve my cards with colored backs it won’t matter that the back says location and I can print the cards on regular paper versus card stock. The “themed” storage box was just an “extra” for me. Yea. A much more expensive expansion compared to the other “card only” ones, but I was able to at least justify my choice. I’m not trying to convince you to buy it. That’s your choice. Just offering up how I approached the choice. The footlocker expansion was worth it for the awesome mounted board and lengthy scenario book, won't play without it now. It also comes with a bunch of quality, thick, plastic dividers to sort stuff as well. Highly recommended storage solution that comes with a bunch other stuff to boot. 2nd Ed comes with a mounted board. 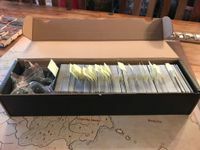 I’ve picked up a cardboard 800 card storage box for £1.80! It does, but the one in the Footlocker is the “updated” layout from Warfighter: WWII. Some prefer it over the one in the base game. I haven’t played with the updated version yet so I’m not sure which will be “better”, but not turning the location cards sideways will make them easier to read. Of course I don’t turn the sideways now. At first, I just bagged everything in the box, which was fine. And that included the Stealth, Support, Speedball and the Eastern European Advisories packs. But while I was at Pat Catan's (a regional craft store here in Ohio) I saw these unpainted wood boxes that resemble weapons/ammo crates. So I opened it up and saw the perfect space for cards and a small compartment for tokens. I use dice for most of the tokens but they do fit as well. The only thing is it's too small for sleeved cards. But I don't sleeve them anyway. So I bought it, painted and stenciled it. It works perfectly. James, if you don't get the Footlocker you won't be able to play my Bravo Two Zero mission from the scenario book! So my £1.80 card storage arrived and I’ve moved my cards in. Before I spend an age trying to make some nice dividers, I expected that someone here would have done the same and uploaded a file, but alas not. Or have you, but not uploaded the file? Pretty Please?! Never mind, I picked up some CCG dividers for £1.99 on Amazon!